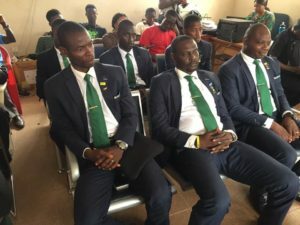 Sierra Leone Football Association (SLFA) referees manager, Mohamed Bowen Freeman has confirmed they are planning to host a seminar for all premier league referees before the commencement of the 2019 premier league. The seminar aims at guiding the referees and informs them of their responsibilities towards officiating league matches as well as giving the fans and everyone good matches. “We are also planning to have a seminar for all Premier League referees before the commencement of the 2019 Premier league,” Freeman said adding that FIFA is saying that referees must recognise, resist and report any form of match manipulation. He said: “The game is as beautiful as the referees; good refereeing implies good game while bad refereeing implies bad game.”Freeman further revealed that his department has trained referees nationwide on match manipulation and match fixing including the 94 amendments of the FIFA Laws of the game. In related development, the SLFA Acting President, Brima Mazola Kamara has handed over refereeing materials to seven (7) Sierra Leonean international referees for their engagement in 2019 FIFA and CAF competitions.Among the seven (7), three are central referees; Raymond Coker, Dawdu Williams and Thomas Patrick Kangoma while the four (4) are assistant referees; Michael Conteh, Franklyn Angel Foray Marrah, Ibrahim Bah and Musa A. Sandy.